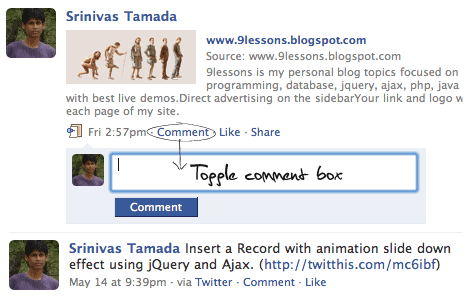 Implement Facebook like toggle comment box for every updated wall. I had designed a simple example it contains of very simple jQuery and PHP code. Part 2: Submit multiple comment forms with jQuery and Ajax. Wouldn't you want to do this since you've already created a variable for $(this) ? If you add focus to textarea when the comment button click similarly, if the textarea lost focus,we can hide it. Nice post! I'll implement it for my new project. AJAX is really powerful behind web 2.0 applications. To use the jQuery functions in our HTML document, we have to download the latest jQuery library from the jQuery download page and include the library in the document with a script tag like the following in the head of the page. Can you help me to show what his script contains to me? Could you please give me mootool version for this effect? does the page refresh on posting the result ??? thanks srinivas. be looking forward to it. currently i use facebook template for my blog here: http://adammale.blogspot.com, so i'm looking forward to add a comment box like facebook to the home page. thanks again! Actually, i dont see point of toggling style .active when its nowhere defined? Im not jQuery expert, actually im newb, just doesnt make much sense to me. Thx.. really useful.. i like this..
it is nice. it displayed the rows but may i ask why the comment input when clicked does not append to the database? can any of you help with this, like a mysql table plus some additional details? thanks people. Any chance of getting such a thing with asp.net? not so great, the page reloads. its not ajax. i have a problem, in firefox works perfect but in safari the textarea is not displayed. Well now I trying the code I hope work, because I have many problems. now check ..
hmm.. i think this will slow down page load big time.. a better solution would be to have 1 hidden comment form, and clone it when "comment" link is clicked, then slide it.. Thanks for the wonderful site. Having the good article. Pretty cool.. Thanks a lot..
really useful.. i like this.. Your post is really good worth of reading and useful to everyone. When a jQuery object is passed to the $() function, a clone of the object is created. SmokeStik electronic cigarette functions on the similar lines of other electronic cigarettes, but has an exclusive and a new technology in its products. I really like this Easter basket, it is one of the best tradition that we can give to all and teach in order not to lose it at all. for share this fabulous post.. Thanks.!!! Cool Blog. Keep up the good work Srinivas. Very, very nice sampling of Blogger themes. Many are sleeping on SEO-friendly BlogSpot / Blogger websites simply because designers prefer WordPress and therefore offer better themes but these are just as good and some are even better. Thanks! demo doesnt work... when you press submit the content doesnt show. Excellent article! It is obvious that you did a lot of trouble to research and write this article. I added some mini chocolate chips & they paired nicely with the cinnamon sugar. The top was crunchy too from the coating, which was nice. I like the framework for this article. This one is goes to a suitable data for me and i trust different people who are looking for after down this sort of stuff will take social events of shocking data in this post. Grateful concerning offering such solid subject here on the web. sir please make a tutorial php,mysql,javasript ,xml responce.like facebook time auto change or comment auto load. I have some what different requiremens so will be looking for your reply to code something for it.